Solomon's temple stood in Jerusalem for almost 400 years. It was the crown jewel of Jerusalem, and the center of worship to the Lord. Almost half of the Old Testament writings took place during the time when Solomon's temple was still standing. Understanding the significance of its location, history, and design can greatly add to one's reverence for one of the most holy places in the world. The city of Jerusalem is located in an area of three major valleys, the Hinnom, the central or Tyropoeon, and the Kidron valley. 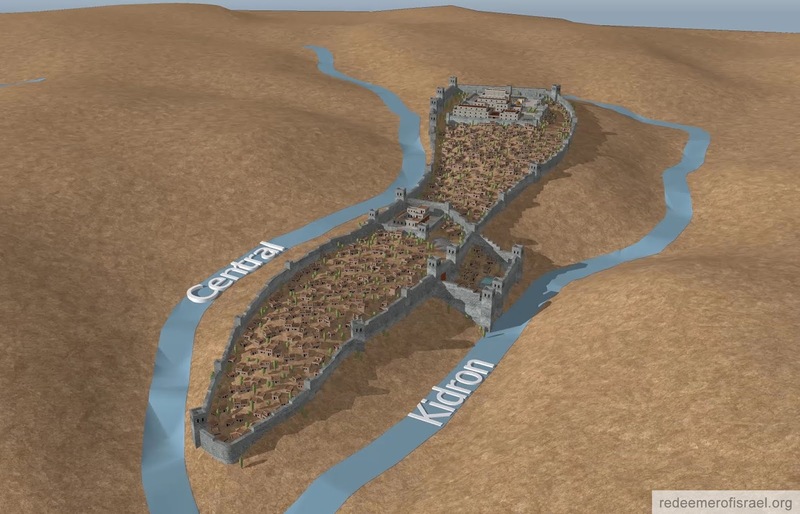 The mountain range between the Central and Kidron valley is called Mount Moriah. The peak of the mountain is a large protruding flat rock, which is now located under the Dome of the Rock. According to Genesis 22:2 Abraham was commanded to sacrifice Isaac in the "region of Moriah" connecting the temple mount with this significant event. At the time of king David, the area of Jerusalem was controlled by the Jebusites, the city only occupying the southern part of the central ridge. When David captured the city in about 1000 BC, he made Jerusalem his capital. 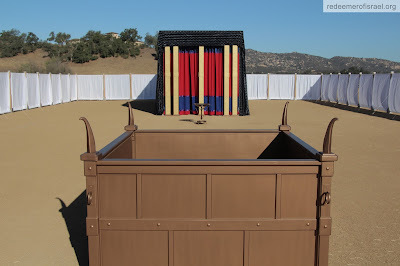 David then moved the ark of the covenant to Jerusalem and began preparations for building a permanent structure to replace the portable Tabernacle of Moses that had been used for over 400 years. With the ancient city of Jerusalem being fairly small, David purchased the threshing floor of Araunah the Jebusite so he could expand the size of the city. Being higher than the city of David, the hill top would make a beautiful place to build the Temple of the Lord. Under the reign of David’s son, King Solomon the Temple construction began. After seven years of construction, in about 960 BC, Solomon finished building the temple, most likely built over this same protruding rock of mount Moriah. Solomon also built himself a new palace just south of the temple and expanded the walls and the city up towards the peak of mount Moriah. 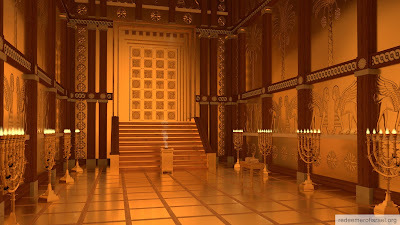 The Temple of Solomon was modeled after the Tabernacle of Moses. Because of the many similarities between the Tabernacle and the Garden of Eden, many scholars believe that the Garden of Eden was the prototype for the Tabernacle, and thus later temples. According to Jewish tradition, Eden was located on a hill, with the tree of life and the tree of knowledge of good and evil at the center of the hill. The Bible teaches that when Adam and Eve transgressed and partook of the forbidden fruit, they were cast out towards the east. Cherubim and a flaming sword were then placed at the east entrance to prevent them from partaking of the tree of life, as they would then live forever in their sin. In order to return back into the presence of God, Israel had to symbolically retrace the steps of Adam and Eve, passing the cherubim and reentering the garden in a westward direction. The Tabernacle was set up in this same east to west progression, seeming to replicate the Garden of Eden. The Tabernacle was divided into three main courts, the outer court, the Holy Place, and the Holy of Holies. The outer court represented the fallen world, while the inner courts represented a more sacred and holier way of life. In essence, as the high priest, who represented all of Israel, progressed through the Tabernacle, or temple, he left the world to enter a more holy state, and then was enabled to reenter the presence of the Lord, passing the angels or cherubim who were embroidered on the veil. Solomon's temple replicated this same three level progression, doubling the floor plan size of the Tabernacle sanctuary for the temple structure. 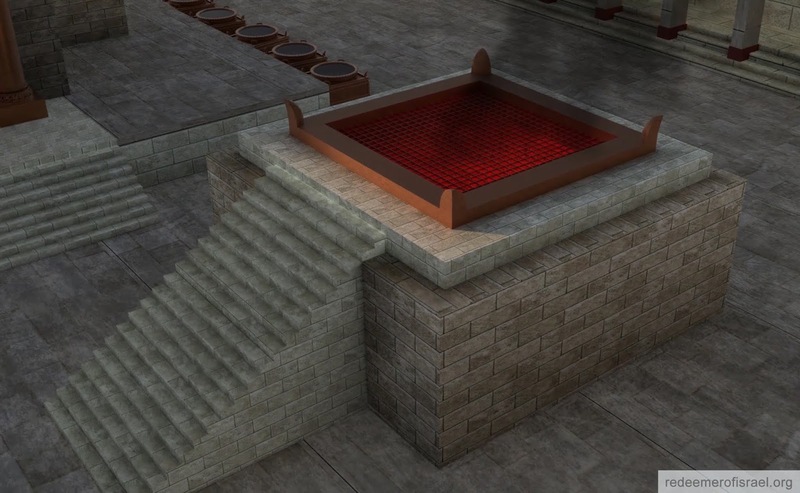 As one approached the Temple of Solomon, the first thing noticed was the brazen altar of sacrifice. The altar was 20 cubits long and wide, and 10 cubits high, a cubit being the length from the elbow to the tip of the longest finger, or about one and a half feet. On the four corners of the altar were four horns, horns often repressing power. This is where the sacrificial animals were burned, representing the future sacrifice of the Savior Jesus Christ. On the southeast side of the temple was the molten or brazen sea, which rested on the backs of 12 oxen, three pointing in each of the cardinal directions. In ancient times, oxen represented strength, and the number 12 often represented the 12 tribes of Israel. Water from the larger brazen sea was poured into ten bronze water basins on both sides of the temple, which could then be wheeled around the outer court for various washing and cleaning rituals by the priests. Around the south, west and north sides of the temple were three floors of chambers or storage rooms. The inside wall of the chambers was stepped, so as to create a ledge where the timbers of the floors could rest. The storage rooms were accessed by a door on the south side of the temple, with wooden ladders going up into each of the floors. At the front of the temple were two large bronze pillars that flanked the porch. The pillar on the left was named Boaz and the pillar on the right was named Jachin. The tops were decorated with lily flower petals and pomegranates. Pomegranates were a sign of prosperity and posterity, because of their many seeds, and were also found on the bottom hem of the clothing of the high priest. The main temple doors were made of two large bi-folding doors covered in gold with cherubim, palm trees, and open flowers. The Bible describes the doorframe as being a "fourth part of the wall" which most scholars believe means that the door had four stepped frames. The interior doorway of the Holy of Holies was similar, except having five frames instead of four. The priests, who represented Israel, were the only ones allowed into the inner temple. This means that Israel only could enter through being represented by the priests. Once you entered the main doors you entered the Holy Place, a large room, 40 cubits long, 20 cubits wide, and 30 cubits tall. 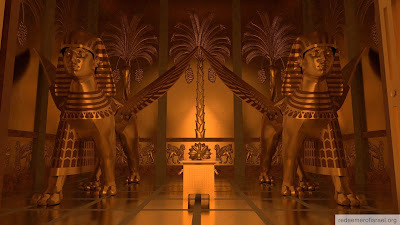 The room was overlaid with gold, and decorated with cherubim, palm trees, and open flowers, possibly alluded to the beauty of the Garden of Eden. The room was lit by the ten large menorahs, five on each side of the room, that were constantly burning, and narrow windows on each side of the top of the room. On the right side of the room was located the table of showbread which had twelve large flat pita like loaves. The priests ate and then replaced the showbread every Sabbath, similar to our weekly partaking of the communion or sacramental bread. Breaking bread and sharing a meal with someone in ancient times represented that you were at peace with them and was a sign of brotherhood, love and forgiveness. Directly in front of the Holy of Holies was the altar of incense. The altar was similar to the altar of sacrifice in that it had a square footprint, and also had four horns, one on each of the corners. However, on the altar of sacrifice was burned the flesh of animals, while upon the altar of incense burned a sweet combination of incenses. The incense burning before the veil of the temple represented the prayers of the saints ascending to God before the veil. A reminder that before we can enter God's presence, our lives, prayers, and actions must become a sweet savor unto the Lord. Only the High Priest was able to enter the Holy of Holies, and only on one day a year, the Day of Atonement. Before entering, the High Priest passed through a beautifully embroidered veil woven from purple, red, blue, and white threads. The colors were the same as used in the ephod and breastplate of the clothing of the high priest, minus the gold thread. Embroidered on the veil were cherubim, who symbolically guarded the dwelling place of God. As the High Priest passed through the veil he had to pass these angels, who like in the Garden of Eden, guarded the way back to the presence of Lord. 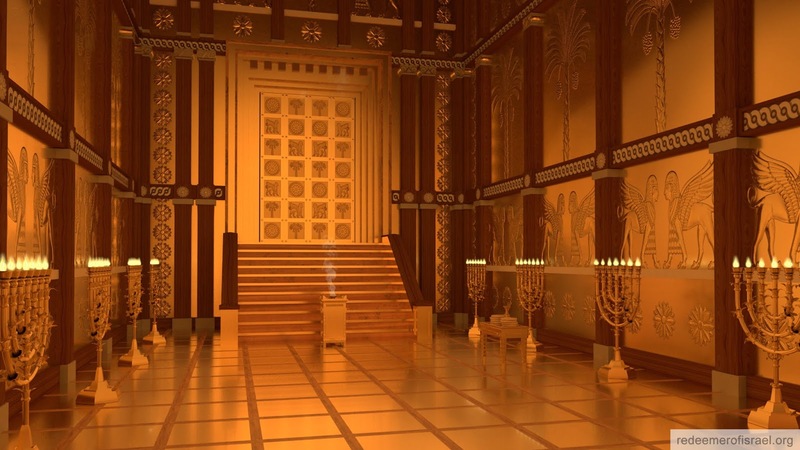 Upon entering the Holy of Holies, you would find that the room is the shape of a perfect cube, being 20 cubits wide, long and tall. The walls were likewise overlaid with gold and decorated with cherubim, palm trees, and open flowers. 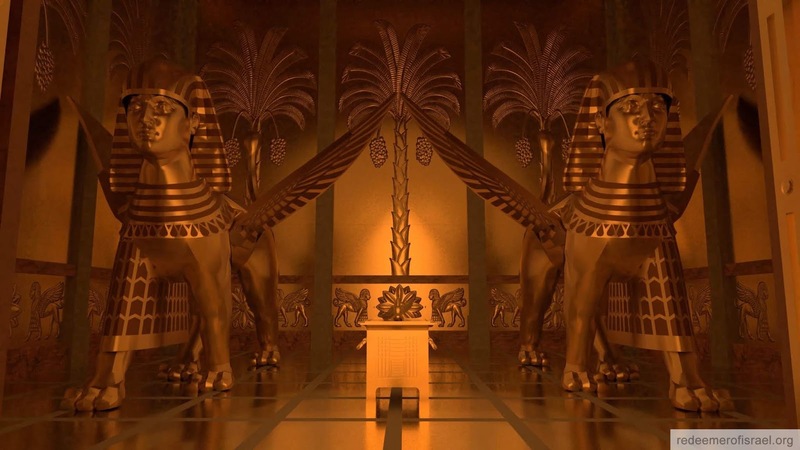 Two large cherubim flanked the ark of the covenant, which was in the center of the room, with their wings stretching from one side of the room to the other. This room is where the presence of the Lord would dwell and represented the final goal and destiny of all Israel. Solomon's Temple was not only a landmark for the city of Jerusalem, but more importantly, the dwelling place of the Lord. The layout represented Israel’s progression back into God’s presence and was designed to teach Israel that it was only through the infinite sacrifice of the sinless Messiah, that they could once again enjoy the presence of the Lord. A sacrifice that would be performed on a cross only a short distance from this holy mount.